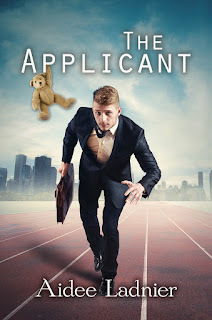 Goddess Fish Promotions has organized a Virtual Book Blast Tour for THE APPLICANT by Aidee Ladnier, a M/M SciFi Time Travel Romance available now from Dreamspinner Press. Oliver stilled, pinned by that earnest gaze. He reached up to cup Forbes’s cheek in his hand. Forbes turned to plant the kiss in his palm as Oliver knew he would. “What do you mean?” Forbes let his hand slide out of Oliver’s grasp. “I know this sounds crazy… but I’m from the future, and in my time, I already work for you.” Oliver grinned, but it didn’t last. Forbes had begun backing away from him. Crap, the Doc probably thought he was a madman. He could practically see the gears whirling behind Forbes’s eyes. Oliver had to trust that his curiosity would come overcome his fear. Bingo. Oliver recognized that stubborn look. He’d seen it each and every time he made sandwiches with bean sprouts and spinach. Forbes ate those sandwiches too. Aidee will be awarding a $50 Amazon or B/N GC to a randomly drawn winner via rafflecopter during the tour. It's my pleasure. The book cover looks great! Thank you!!! I love this cover. So whimsical! The sequel is actually already published! You can find THE BREAK-IN at Dreamspinner Press. Be aware, the series is named the BUSTED LABS series for a reason. But there's another fun robot!